Each chapter in this practical guide covers a month of the year and includes advice on what is happening in the garden at that time, and which veggies, fruit and herbs you should be planting and harvesting. There are also delicious seasonal recipes using fresh produce - try the Haloumi Asparagus and Roasted Tomato Salad or the Beetroot and Chocolate Cake. 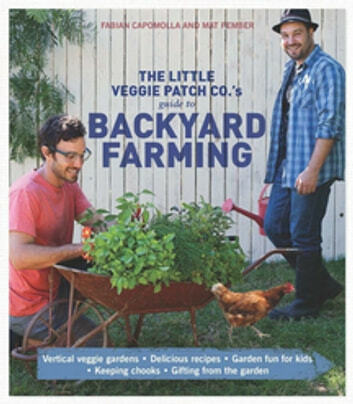 The Little Veggie Patch Co's Guide to Backyard Farming is packed with fun and easy-to-follow activities such as keeping chickens, growing plants from cuttings, making cider and tomato sugo, and starting a backyard beehive. Learn how to use your home-grown produce to make delicious preserves and jams, or create garden-inspired gifts such as wooden herb markers or stencilled pots. On top of this, there are lots of activities that are perfect for kids, including sowing seeds, planting seedlings and making lemon cordial. So, it's time to get into your garden (or out on your balcony or nature strip!) and get your hands dirty. 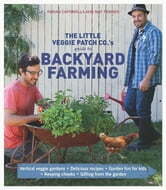 Regardless of what kind of outdoor space you have, Fabian and Mat will help you grow fresh fruit and veggies, put great food on the table and discover your own inner backyard farmer.